Kees Wheels: Does your Kees commercial zero turn need a replacement wheel? 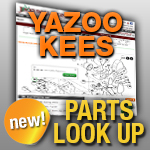 We carry deck wheels, solid front tires, and wheel assemblies for your Kees zero turn lawn mowers. Select the wheels you need to below.